University of California Press, 9780520290723, 688pp. 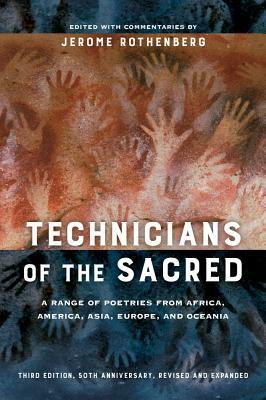 Hailed by Robert Creeley as “both a deeply useful book and an unequivocal delight” and by the LA Times Book Review as one of the hundred most recommended American books of the late 20th century, Jerome Rothenberg’s landmark anthology Technicians of the Sacred has educated and inspired generations of poets, artists, musicians, and other readers, exposing them to the multiple possibilities of poetry throughout the world. Juxtaposing “primitive” and archaic works of art from many cultures with each other and with avant-garde and experimental poetry, Jerome Rothenberg contends that literature extends beyond specific temporal and geographic boundaries, while acting as a retort to those who would call that larger humanity into question. A half-century since its original publication, this revised and expanded third edition provides readers with a wealth of newly gathered and translated texts from recently reinvigorated indigenous cultures, bringing the volume into the present and further extending the range and depth of what we recognize and read as poetry. Jerome Rothenberg is an internationally acclaimed poet and anthologist. His more than ninety books include the multivolume Poems for the Millennium, coedited with Pierre Joris, Jeffrey Robinson, and John Bloomberg-Rissman. He is Professor Emeritus of Visual Arts and Literature at the University of California, San Diego. "If there is anyone out there struggling to write lyrics, get your hands on this book; immerse yourselves in it, live inside it for a while, free your mind, and you will emerge brimming with ideas."